The Department of Interior and Local Government (DILG) gave funding support to the Misamis University College of Dentistry with Ozamiz City Health Office and Misamis University Community and Extension Program (MUCEP) for the recently conducted training on Basic Oral Health for Barangay Health Workers in Ozamiz City (BOH for BHW) last February 20-23, 2018 with the theme "Lig-on nga mga ngipon, importante sa himsog nga panglawas..Ampingan natong tanan! "(Healthy teeth, important for health …Let us all take care of our teeth!). The training was participated in by 51 BHWs from 51 barangays of Ozamiz City as the conduit for the delivery of primary oral health education and services to communities. After the three-day training, the BHWs were expected to identify the functions of different parts of the mouth, benefits of good oral health; discover the ways to achieve oral health and its contributions to general health and well being; know the importance of proper nutrition in prevention of tooth decay; understand the various healthy eating habits and benefits of drinking water daily; identify the different healthy foods choices for the body and teeth and well oriented to the ill effects of smoking to the body. Resource persons actively shared their expertise in oral health. These included the faculty members of the College of Dentistry who are also dental practitioners. They are Dr. Marlo Engelberto Lasutaz Sr., Dean, Dr. Myles Lasutaz-Pusod, Dr. Lorace Vilasquez- Revil, Dr. Marisa L. Villa, Dr. Aldred Gwain P. Lasutaz and Dr. Marlo Engelberto P. Lasutaz Jr. Ozamiz City Health Office Dentist Dr. Jojie F. Demecillo took the time to be with the participants throughout the training and shared her expertise. Mrs. Grace V. Villanueva, the Director of MUCEP, with her staff facilitated in the workshops and open fora. The training was very informative and interactive. The participants learned vital information from the resource persons and from the various learning activities carried out such as the proper tooth brushing technique and flossing, waste no words activity, actual experiment (known as "eggsperiment"), interactive discussion, and workshop. During the open forum, the BHWs actively participated by asking questions, giving comments and even sharing their experiences in the field. The BOH for BHW training is the last part of the project entitled “Basic Oral Health Care Knowledge of Primary Health Workers Appraisal: Basis for Misamis University College of Dentistry Oral Health Education Program” which was also jointly undertaken by Misamis University with the DILG-BLGS and the LGU of Ozamiz City. This project was based on all of the four (4 ) DILG –Citizens Satisfaction Index System (CSIS) results from 2013-2015 which indicated that basic dental/oral hygiene consistently got the lowest scores in 3 categories: awareness, availment, and satisfaction among health services. Top , MUCEP staff Ms. Hanzen Tomatao with Ms. Yunalyn L. Villantes facilitated the registration. Above, Director G. Villanueva welcomed and acknowledged the participants, and gave the introduction on the basis of the training: the DILG Citizen Satisfaction Index System (CSIS) Survey. Results from the cities of Ozamiz, Tangub, Oroquieta and from the Municipality of Plaridel that indicated Health Services of the LGU as the leading LGU services, but Oral Health being the most neglected health service, thus, the project being funded by the DILG, and implemented with the LGU-CHO Ozamiz City and the MU College of Dentistry. Above right, Dean Dr. Marlo Engelberto C. Lasutaz Sr. also welcomed the participants and gave the rationale of the activity, again citing the previous DILG CSIS study, the assessment of the BHWs Knowledge on Basic Oral Health, and the ensuing partnership of DILG, Misamis University, Phil. Dental Association-Ozamiz City Chapter and LGU of Ozamiz City through the City Health Office. Below, Dr. Lorace V. Revil with Dentistry students expound on Oral Health Awareness, importance of teeth, dental caries, proper tooth brushing, use of dental floss, fluoride to prevent plaques, tartar. Below right, Dr. Marissa P. Villa stressed the importance of Relationship of Diet, Proper Nutrition, and good oral health influence on ones confidence and personality. Below, Dr. Myles Lasutaz-Pusod assisted by Dentistry students conducting the "Eggsperiment", a 24 hour experiment to show to the participants the undesirable and serious effects of vinegar, tea, juice and soda drinks to the teeth. Above Dr. Aldred Gwaine P. Lasutaz discussed the “Danger of Smoking to Oral Health “ included in his discussions were the extent of harm smoking can do to the body, the chemicals present in the cigarette…dangers and effects. 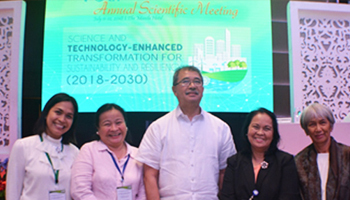 Dean M. Lasutaz and Dr. J. Demecillo of the CHO also joined in the discussions. Above right, Dr. Marlo P. Lasutaz Jr. gave further explanation on the very dangerous effects of smoking not only to oral health but also to overall health. They also demystified some myths and beliefs regarding oral health. Both stressed to the participants the value of good oral health practices, healthy lifestyle, regular dental checkup among others. Above and below, MUCEP Director Grace V. Villanueva facilitated the planning session for the BHWs Information, Education Campaign on Oral Health or “ ways forward” so their learning can be applied in their respective barangays. During the planning, BHWs suggested that they will present their proposed activities to their respective Barangay councils. The BHWs proudly showing the poster prepared and designed by the organizers from MUCEP, Ozamiz City CHO, PDA-Ozamiz City Chapter, faculty and students of Misamis University College of Dentistry to be installed in their respective Barangay Health Centers. MUCEP staff Ms. Golda Grace O. De La Pena assisted in the layout.